The above image was a sign that hung over the desk of the late Hunter S. Thompson. 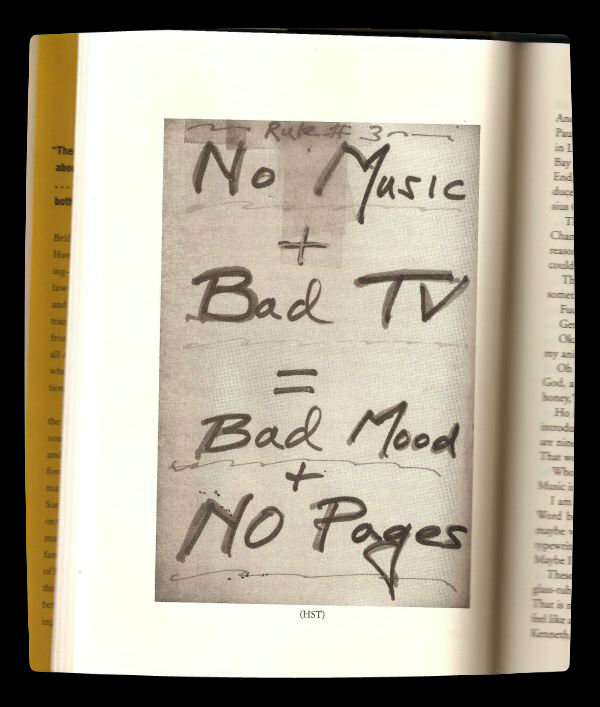 The words on the sign, no music + bad TV = bad mood + no pages, were a warning the writer issued to himself. If you have ever read one of Thompson’s books, you know that he made a point to live his life in a sporadic, chaotic, but fulfilling manor. When I think of Nietzsche’s admonition to “live life dangerously,” I can’t help thinking of Thompson as a perfect example. But even if you “buy the ticket and take the ride,” as Thompson suggests, there is still a matter of sitting down and writing about the ride, which is probably as agonizingly fulfilling as the ride itself. Thompson was not just a man of action, as his stories suggest, but also a man of thought. And to meet those deadlines, Thompson as a writer had to figure out what exactly he needed to do to get the words on paper. The above rule is just one of the many things he figured out about himself, as a writer and a person. I think Thompson’s rule probably applies to all of us. If we leave something uplifting, like music, out of our lives, and replace it with mindless television shows, it will be no surprise when the manuscript begins collecting dust and the type writer begins to rust. Of course, Thompson’s formula was a personal rule. But the essence of the rule, don’t fill your head with too much junk, should be given serious thought by every writer. 100% for insight, it’s like doing the wash up alone tired and bored, you turn on the music and your suddenly in the middle of your personal revolution. Yeah, I couldn’t Imagine having much of an imagination without music. Really like this and it’s so true. I need a good soundtrack and no brain-sapping distractions when I write. I quite fancy living in a “fulfilling manor” – shame I can only manage a characterful semi! Very true, I can’t argue with that. great. I do not understand who you’re however definitely you’re going to a well-known blogger in the event you are not already.